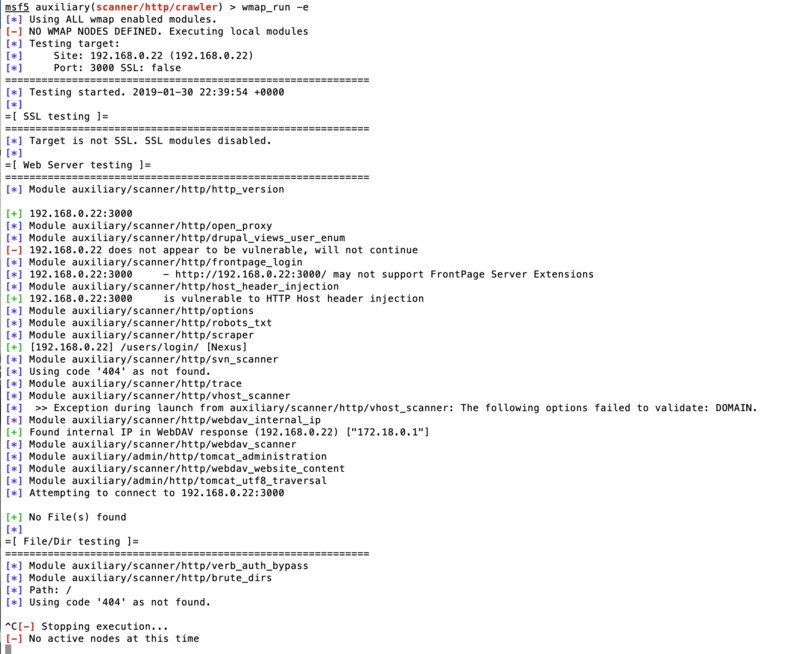 I am trying to run a wmap scan on a web app locally on my Mac. But when wmap reached File/Dir testing, more specifically the brute force module, it does not show anything for path (even though the path was defined, as it works for the other modules) and follows it up with 'Using code '404' as not found. ', then completely freezes, even after trying to press ctrl+c to exit out of it, it shows that it tries to stop the execution, however it freezes there once again, which only allows me to close terminal and start all over again. I have included a screenshot of this. Am I doing something wrong? Browse other questions tagged penetration-test vulnerability metasploit vulnerability-scanners terminal or ask your own question. Metasploit automatic module execution on receival of shell?